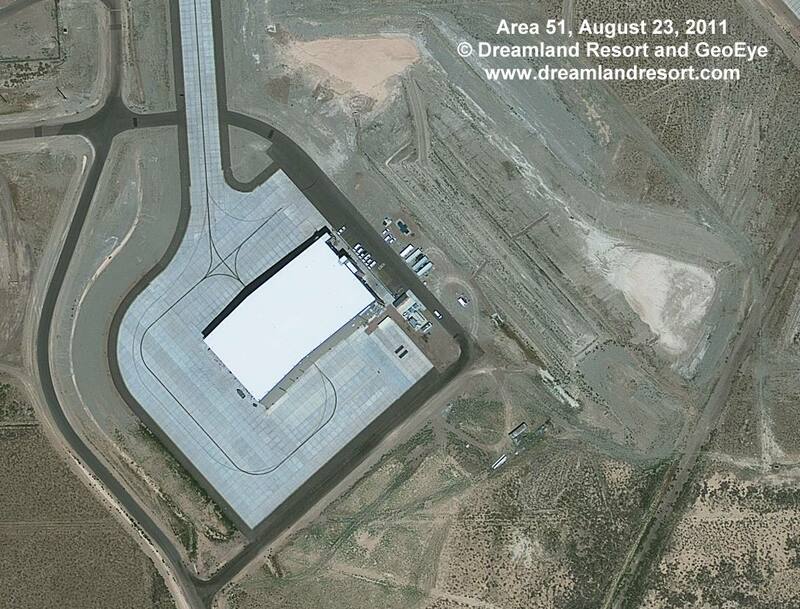 Construction of the ramp around this large new hangar built on the far south end of the base seems to be finished. We discovered construction of this hangar from Tikaboo on June 10, 2007. The hangar appears to be operational, and there is no indication of any further construction in the vicinity in the near future. There has been much speculation, but it is still not clear what project "lives" in this hangar. There has been no convincing explanation for the location far away from the other hangars, for the orientation in an angle to all other buildings at the base, or for the berm of dirt east of the hangar. It has been suggested that it is to block the view from Tikaboo, but it seems that a simple view screen would have accomplished the same. Satellite image taken by the GeoEye-1 satellite on Tuesday, August 23, 2011 at 11.23am PDT. © 2011 Dreamland Resort and GeoEye. Publication outside of the Dreamland Resort web site is strictly prohibited.